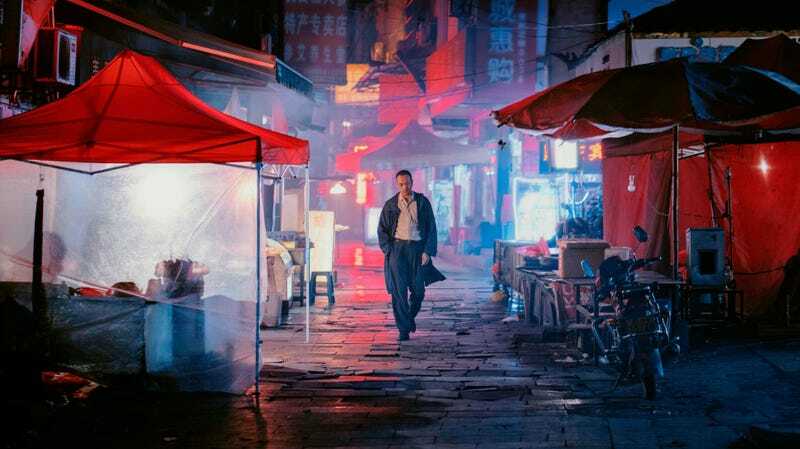 Drip-drip-drip, drizzle-drizzle goes the terrifically immersive soundtrack of the Chinese writer-director Bi Gan’s sophomore feature A Long Day’s Journey Into Night—a film in which it always seems to be raining, even when it isn’t. Drops recall tears, washing up misty fragments in the mind of the remorseful former gangster Luo Hongwu (Huang Jue): the death of the gambler nicknamed Wildcat; the mystery woman who called herself Wan Qiwen, “a movie star’s name;” her boyfriend, the karaoke-loving local crime lord; the gangland killing that led Luo Hongwu to skip town almost two decades ago. He has returned, still haunted by his affair with Wan Qiwen, still carrying a book she either left for him or forgot—one ambiguity of many in a film that, for most of its first half, slips by like a semi-familiar noir, watched while nodding at the edge of wakefulness. Then, at around the midpoint, Hongwu ducks into a dilapidated movie theater to kill time and falls asleep. It’s at this point that the audience is instructed put on their 3D glasses. The rest of the movie—a nearly feature-length 3D long take—is his dream. Bi’s intriguing and idiosyncratic debut feature, Kaili Blues, used the story of a reformed ex-con’s search for his nephew to lyrically ruminate on memory and time. Produced on a much larger budget (and with bona fide movie stars), A Long Day’s Journey Into Night represents a leap forward in technical and formal ambition; its two very different halves, both of which are almost long enough to be standalone movies, could be said to represent different experiments in representing the subconscious. The first is based on ellipses, skipping back and forth between Hongwu’s memories of Wan Qiwen (Lust, Caution’s Tang Wei) in the early 2000s and the gray-haired, present-day Hongwu’s attempts to unravel the events of the past, which lead him to a women’s prison, a dingy hotel, and a seedy nightclub on the verge of demolition, with side trips to visit his family’s shuttered restaurant and pay his respects to Wildcat’s mother (Sylvia Chang). Bi’s approach to this section is artful collage, drawing us into moments through memorably composed long takes and subjective sound design. He lingers on mementoes (a broken clock, an old photo, Qiwen’s book) and notes of glamour (namely the contours of Qiwen’s green dress) in a way that sometimes brings to mind the romantic metaphors of Wong Kar-Wai. Other arthouse heavyweights come to mind, too. Bi is a burgeoning talent, but still early enough in his career for a viewer to play spot-the-influence; the more obvious ones are Andrei Tarkovsky, Hou Hsiao-Hsien, David Lynch, and Wim Wenders. (The last is the least promising, as Bi seems to have picked up some of the German director’s longwindedness.) But then, those are memories, too—films about the repressed subconscious, love, and the sad passage of time melting together in a young filmmaker’s mind. If the first half of the film occasionally begs to be picked apart as a look inside Bi’s head (e.g. a waterlogged torture-slash-karaoke sequence that seems to fuse Blue Velvet with Stalker), the second plants us inside Hongwu’s—a pièce de résistance of labyrinthine long-take camerawork, choreography, and dream logic that the earlier stretch of the film has prepared us to decode. Hongwu knows that he has fallen asleep in a movie theater, but he doesn’t know that he’s dreaming. He finds himself in a mineshaft (not unlike the one where Wildcat’s body was found) and then in a cave that a little boy calls home, eventually venturing down from the mountains into a purgatorial pool hall managed by Kaizhen (Tang again) and a decrepit town square that is hosting an all-night karaoke contest. Though his symbolism sometimes errs on the side of obviousness, Bi shows an uncommon knack for recreating and exploring the space of a dream—its transforming identities and places, the unreality made more transportive by the 3D format’s underutilized potential for creating dramatic space, matched by the mutations of the camerawork from close-up to tracking shot to crane shot and back again. (Even more impressively, he does it without obvious digital effects; if there are cuts here, they are extremely well hidden.) What’s more, Bi recognizes that dreams, like memories, only appear to hold answers to our lives. Like Hongwu’s past, his dream odyssey offers only the tantalizing possibility of closure. But, like the saying goes, the journey is the destination.